Kaitlin Doud delivers a pitch. Doud drove in runs in both games against the Hoyas, including a home run in game two. Jimmy Lafakis/Collegian file photo. 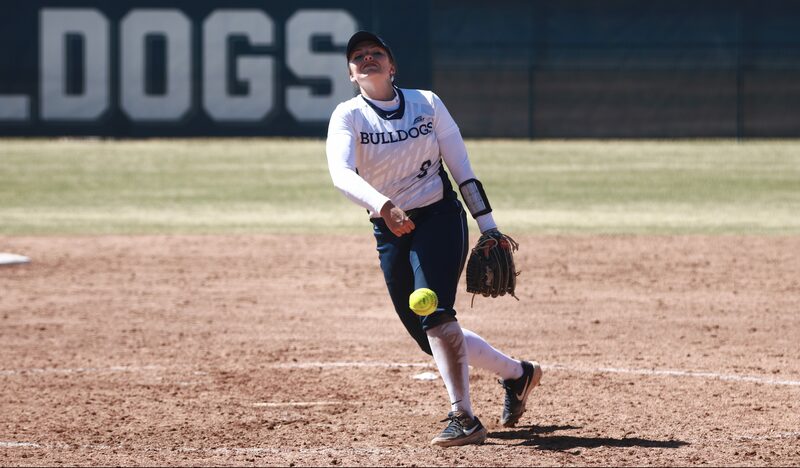 The Butler softball team fell in both halves of its doubleheader with Georgetown on April 13. The series finale on the 14th was canceled due to rain. Heading into the weekend, the Hoyas had a Big East conference-worst team earned run average of 6.75, but it was solid pitching that secured both wins for Georgetown. Georgetown pitchers Katie Vannicola, London Diller and Cassie Henning combined for a 3.21 ERA on the day. Georgetown had beaten Butler just twice before their two wins on Saturday. They improved to 4-10 all-time against the Bulldogs. In game one, Butler’s late rally fell short as the Bulldogs were defeated 6-5. Butler led 2-1 after scoring a pair of runs in the fifth inning. Maddie Moore’s single tied the game at one. Kaitlin Doud then laid down a suicide squeeze to score Jenna Foreman from third. After the Hoyas loaded the bases and scored five runs in the sixth inning, Butler trailed 6-2 heading into the bottom of the seventh. Bri Avery and Foreman reached to lead off the inning for Butler. Maddie Moore then singled to make it 6-3. The Hoyas would pull Vannicola, their starting pitcher. Karli Ricketts then brought in a pair off a single into center. The inning would end as Sammy Andersen went down swinging with runners in scoring position. Graves started the game for Butler and took the loss after allowing four earned runs. She struck out eight batters in 5.1 innings. Game two saw Butler struggle at the plate with Henning in the circle. She threw a complete game and retired 19 of 25 batters in a 3-1 win for Georgetown. Henning had a 13.25 ERA heading into the matchup. Ricketts started the game for Butler and also threw a complete game, her sixth of the season. She allowed three earned runs off five hits and struck out five batters. Georgetown took a 2-0 lead in the third inning as they put two runners on off a single and fielder’s choice. A passed ball and RBI groundout from Deirdre Gallo put the Hoyas on the board. Butler’s lone hit of the day that wasn’t scored as a single came in game number two. Doud’s solo home run to left field made it 2-1 through four. The Hoyas would add an insurance run in the sixth inning as Macy Cartright scored on a wild pitch. The Bulldogs would go away quietly in the bottom of the seventh. Butler hosts Eastern Illinois in a midweek affair on April 17. They will travel to take on Creighton for a three-game series April 19 and 20.